The RCARC recently elected new officers for 2016 and set dates for its November and December meetings. Each October, the RCARC is required to elect new officers. This year, most of the officers were eligible to serve another year in their current slots and agreed to do so. Also, the club voted to hold the November meeting on Tuesday, November 17th, 7pm, at the Henderson Central Fire Station. The change is required since the regular meeting dates falls on Thanksgiving. 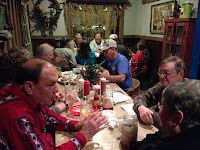 Also, the club has scheduled its annual Christmas dinner meeting for December 15th at Sombreros at 7pm. The RCARC will hold its next meeting on Thurs., April 25, 2019, at 5:30 pm at the Henderson Civic Center. SKYWARN training will follow. Field Day station places in West Gulf! One way Amateurs can help out! Rusk County Amateur Radio Club, P.O. Box 1496, Henderson, TX 75653. Powered by Blogger.